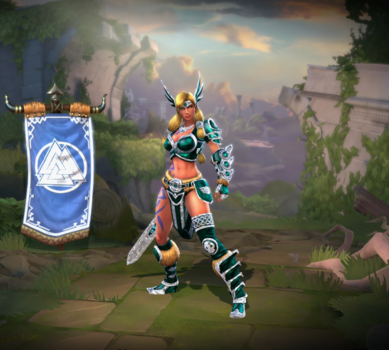 Freya is one of the playable Gods in SMITE. Valkyries, the elite and angelic warriors of the Nordic Pantheon, are as beautiful and dangerous as a midnight winter storm. 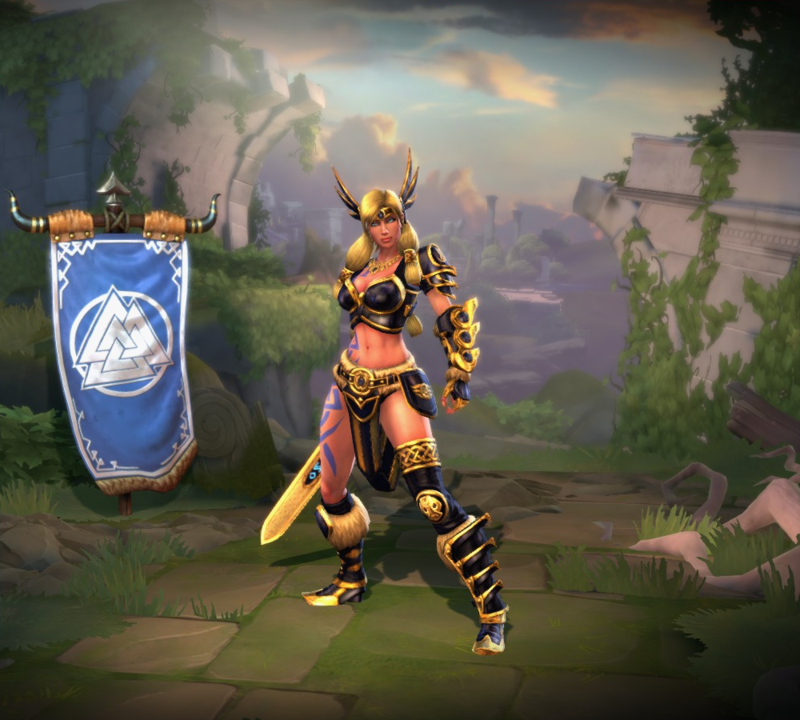 Yet their queen, Freya, so irresistibly desirable, so uncompromising in warfare, make the Valkyries seem nothing more than plain paper dolls. She’s the object of desire for every God, every man, and the envy of every woman. Even the Frost Giants crave her for their own, often devising devious plans to trick or force her into marriage. But Freya is proud and strong, with the cunning to escape her enemies and ruthlessly retaliate. Every rose bears thorns, but this one wields swords. Were it up to her, Freya would have little to do with blood and blades. Her name literally means “the lady,” and none of more worthy of the title. She adores bright flowers, pleasant company, and the sweet lilt of a sad love song. She’s sensual and amorous, invoked by worshipers seeking to bear a child or find a lover. Ruler of the realm of Sessrumnir, a place much like Valhalla, where the souls of dead warriors spend eternity, Freya provides comfort and bliss to the fallen. Once, Freya was married to the mysterious and elusive God, Od. Immediately following their wedding, Od went on a journey to distant and inhospitable lands. So long was he gone the Gods presumed him dead. Distraught and heartbroken, Freya spilled tears of gold and searched the globe for him. Finally, she discovered him ship-wrecked and twisted into a hideous sea monster. Melancholy but loyal, she stayed and comforted him. Though one night, while she slept, a daring hunter slew the beast Od had become. Moved by Freya’s utter despair, the Gods agreed to allow Od into Sussrumnir, despite the fact he had not died in battle, so he and Freya could remain together forever. Can deal up to 320/460/600/740/880 (+120% of your magical power) damage. As Freya kill an enemy God using Valkyries Discretion while you are at 15% health or less. 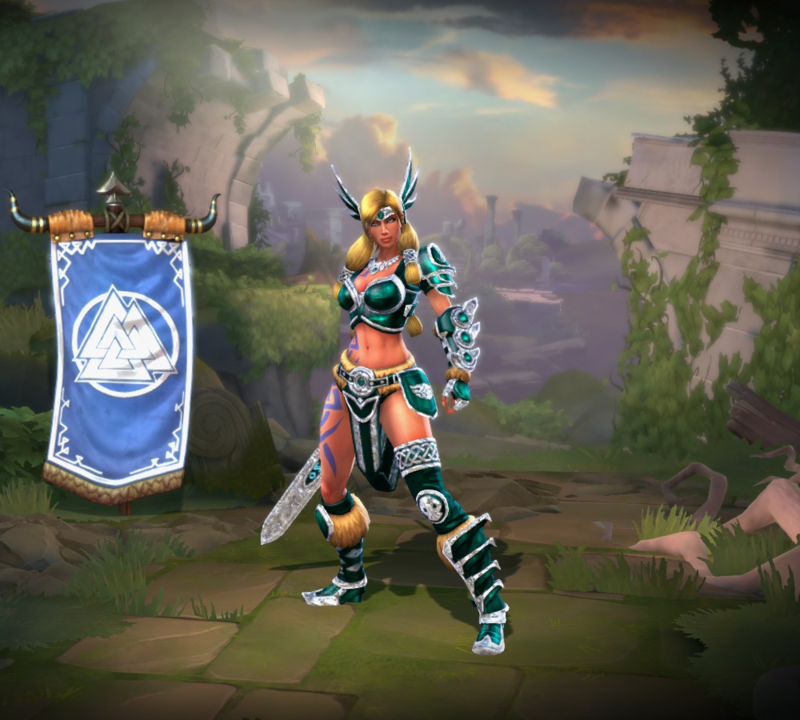 In July of 2016, Freya received a remodel, changing her Default, Northern Lights, Valkyrie and Mastery skins; her Frost Maiden, Pixel Buster and All for One! were unaffected by this change. Before the release of Tyr, Freya's passive let her convert magical power into physical power. One of Freya's jokes, "I'm not naughty, I'm just rendered that way." is a reference to a quote made by Jessica Rabbit in the movie Who Framed Roger Rabbit. This skin will constantly rotate between several colors. This skin and Ravenous Bakasura were the first Tier 2 skin introduced in the game. Several of this skin's voice lines are references to various video games. This skin was based on the French book The Three Musketeers. This skin shares the same voice actress who did Default Freya's Voice Lines. This skin shares the same voice actress who did Nu Wa's voice. This skin makes references to the Star Wars movies. Freya's appearance in this skin is similar to the Twi'leks, a race in the Star War universe. This skin shares its theme with Ordo Solarus Amaterasu, Intergalactic Chang'e, Dark Lord Sun Wukong and SWC 2016 Zeus. 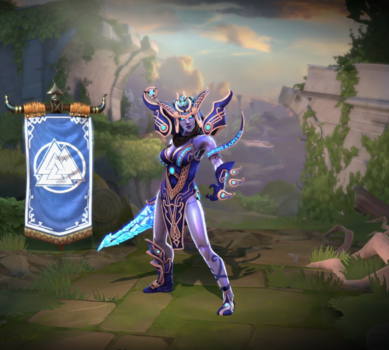 This skin is a reference to the entity who gives King Arthur a magical Sword. This skin was part of the Summer of Smite 2016 event. Decreased Minion Explosion Damage from 50% to 25%. Decreased Ranged Damage Magical Power Scaling from 15% to 10% per hit. Northern Light has been adjusted. Northern Lights when activated, Freya gains 5 shots of Northern Lights. Each Basic Attack consumes a charge even if that attack does not hit. Damage Decreased from 40/80/120/160/200 to 11/27/43/59/75. Damage Scaling Decreased from 40% to 10%. Slow Duration reduced from 2 seconds to 1.25 seconds. Charges last indefinitely. Ability goes on cooldown when all are consumed. Reduced Mana cost from 20/25/30/35/40 to 14/18/22/26/30. Adjusted the text of her passive ability to make it clear that mana is restored, and health is healed. Decreased Movement Speed from 375 to 370. Decreased Magical Power Scaling from 50% to 40%. Fixed an issue where her first ability was healing for 100% instead of 33%. Decreased Base Damage from 70/110/150/190/230 to 50/90/130/170/210. Fixed an issue where her abilities were highlighting too many enemies. Decreased Magical Power Scaling from 60% to 50%. Decreased Mana Cost per shot from 25/33/41/49/57 to 20/25/30/35/40. Brisingamen's Blessing has been reworked to Mystic Warrior. Freya's Melee Basic Attacks heal her for 6% of her Maximum Mana per successful hit. Freya's Ranged Basic Attacks and abilities heal for 2% of her Maximum Health per successful hit up to once per shot. 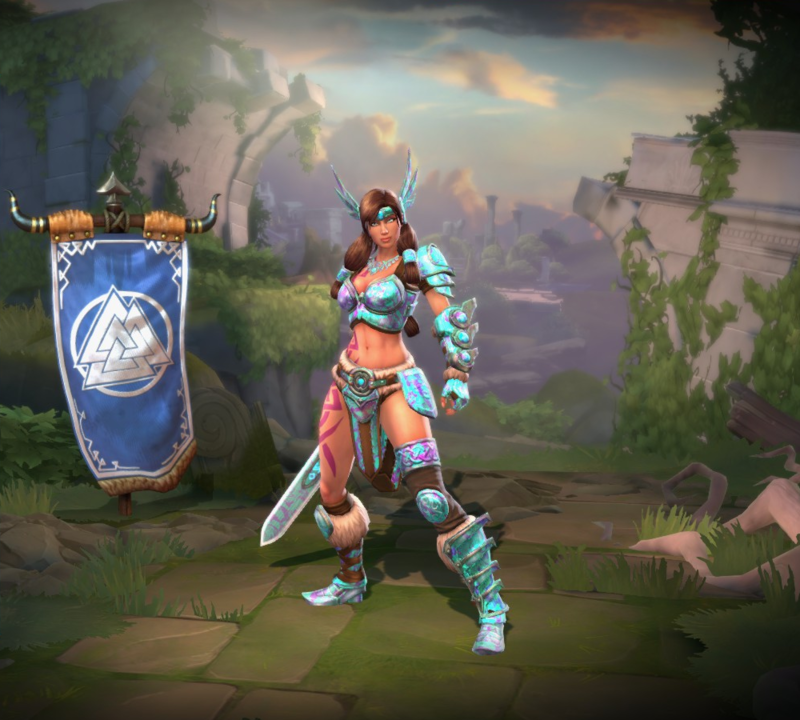 Freya empowers her weapon making the next Basic Attack that hits an enemy within the next 5 seconds deal bonus magical damage in an area around each enemy hit. Enemies hit by the explosion are slowed for 2s. Minions take half damage from the explosion. Gods take 25% damage from any explosion damage after the first. Changed Magical Lifesteal from 15% to 5% + .5% per level (ending at 15%). Decreased Damage from 40/55/70/85/100 to 35/50/65/80/95. Decreased Magical Power Scaling from 25% to 20% per shot. Increased Base Damage from 20/30/40/50/60 → 30/40/50/60/70. Adjusted Banish duration from 1/1.25/1.5/1.75/2 → 1.5s at all ranks. Updated visual FX to show when banished targets will fall. Reduced Mana Cost from 75 at all ranks → 70/65/60/55/50. Freya has undergone a visual upgrade. Fixed an issue with the duration on this ability not matching the buff timer. Updated weapon trails for Standard, Frost Maiden, and Mastery skins. Increased Base Physical Protection from 13 to 14. HP per level increased from 77 to 80. Base ground speed increased from 370 to 375. Increased Magical Protection scaling per level from 0 to 0.9. Added timer on the ground targeter indicating when the ability will expire and Freya will be forced to land. Fixed Freya Northern Lights skin having blown out specular if texture detail is set to High (Material Quality set to Medium). Increased the rate enemies fall back to the ground after being banished. Reduced radius from 15ft to 12ft. Reduced range from 65ft to 55ft. Fixed weapon trails overlapping if her attack speed was too high. Fixed an issue with her body persisting after death. Recovery time reduced from 0.3 to 0.1. Updated loading screen card for default skin. This ability can now be placed inside of walls. After reviewing the impact of the changes made on Freya in the last patch, we have decided to revert the magical power contributions on her Irradiate and Pulse abilities. We will continue to monitor her closely. The magical power contribution has been increased from 20% to 35%. The magical power contribution has been increased from 15% to 20%. NEW PASSIVE - Freya’s necklace grants her an additional +15% magical lifesteal. The magical power contribution has been reduced from 35% to 20%. The +10% physical lifesteal buff on this ability has been removed. The magical power contribution has been reduced from 20% to 15%. The +10% magical lifesteal buff on this ability has been removed. Freya’s recommended items have been updated to reflect her change to all magical based basic attacks. Added new sound fx and hit fx when Pulse and Irradiate are both active. Freya now gains 10% physical lifesteal for 5s. Freya now gains 10% magical lifesteal for 5s. Decreased the cooldown from 13s to 11s. Increased the duration of the banish from 1/1.5/2/2.5/3s to 1.4/1.8/2.2/2.6/3s. Valkyrie's Discretion: This ability now properly removes roots from Freya. Arachne needs to be knocked off when Freya ascends. Freya has been added to the game. Grants 15% magical lifesteal at level 20. This page was last edited on 15 April 2019, at 16:57.